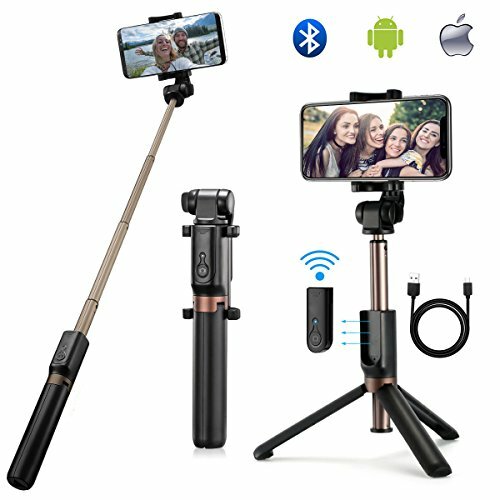 Selfie stick tripod with Bluetooth wireless remote control, small and portable Mini selfie stick allows you to take self portraits and group photos freely. 1. Long press for 3 seconds to open the Bluetooth of the selfie stick tripod and then open your phone's Bluetooth. 2. Search the Bluetooth name" Dispho" and then pair it. 3. Connect the Bluetooth to capture a shot. 4. Finally, long press for 3 seconds to close the Bluetooth. ❤ Bluetooth Wireless Remote -- Advanced remote compatible with iOS & Android devices and no need to download extra APP. All you need to do is to pair with your phone and press the button to capture a shot. ❤【SELFIE STICK BLUETOOTH TRIPOD】-- 2 in 1 selfie stick tripod with built-in Bluetooth remote for IOS/Android. Selfie stick mode - allows you to take selfie-photography or group photos. Tripod mode - record video or face time with your family or friends. It's perfect for you to record every moment of parties, graduation, travel. ❤【LIGHTWEIGHT & EXTENDABLE & FOLDABLE】-- 5.2oz weight, 7.87inch folded size & up to 26.77inch extension length. Lightweight and convenient to put in pocket or bag during travel. ❤【PORTABLE & ADJUSTABLE PHONE HOLDER】-- 3 ways to rotate the selfie stick tripod, 360 degree free rotation. You could rotate it and select horizontal or vertical camera mode to get the best angle photos. ❤【HIGH QUALITY AND EASY TO USE】-- Bluetooth remote control max:33ft & panasonic original battery & 5000 selfies. Comfortable ABS and PC material handle and aluminum alloy shaft selfie stick tripod and non-slip foot pad, the tripod becomes more stable. ❤【100% MONEY BACK GUARANTE】-- We devote ourselves to provide the best customer service. If you are not satisfied with our product, just contact us and we can offer a full refund. If you have any questions about this product by OUSUM, contact us by completing and submitting the form below. If you are looking for a specif part number, please include it with your message.